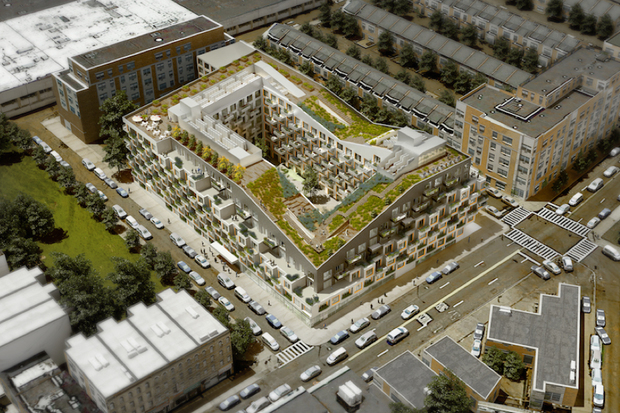 BUSHWICK — A developer planning a luxury residential project on the Rheingold Brewery site has refused to commit to affordable housing promises made during the rezoning process, locals and elected officials say. Rabsky Group, which purchased part of the Rheingold property last year for $53 million, is planning to build a six-story, nearly 370-unit building at 10 Monteith St., according to Department of Building filings. A rendition of the building, revealed in March and designed by ODA New York, showed a tiered building with amenities like extensive rooftop green space, urban farming areas and a library. But reportedly Rabsky Group developer Simon Dushinsky has been silent on whether affordable housing will be included in the luxury property, refusing to meet with community members on the topic, locals and Councilman Antonio Reynoso's office said. Original Rheingold developer Read Property Group only received zoning approval to build on the site after agreeing to provide 30 percent affordable housing and local jobs — and that's a commitment that Rabsky needs to make, too, locals said. "The community has the right to know what this developer's plans are," said Brigette Blood, who's part of community task force Rheingold Construction Committee. "Read [Property Group] had numerous public forms. We have no idea what the new owner's plans are on that site." Blood started a petition on behalf of the committee this week, demanding that Rabsky commit to the same terms as Read. Current plans filed with the city show that Rabsky does not intend to have inclusionary housing in the building at 10 Monteith St. Residents and Reynoso have been trying to meet with Rabsky Group for months, reaching out multiple times for a meeting since the fall. Reynoso's office did not have a private meeting with Dushinsky until May, according to the councliman's office, but the developer did not address affordable housing concerns. Later in May, instead of showing up himself, Dushinsky sent a representative to a meeting with the Rheingold Construction Committee — a move that locals said they considered unacceptable. The representative said he'd get back to the group about their concerns, but hasn't so far, said committee member Bruno Daniel. "It’s a lack of respect," Daniel said of Dushinsky not showing up. "He’s not taking very seriously our situation and our concerns." Rabsky Group did not immediately respond to request for comment. Residents and local elected officials negotiated with Read Property Group for weeks in 2013 when the developer tried to get city approval for the controversial project. After many meetings, Read pledged to include affordable housing on the Rheingold site. But the agreement was non-binding and not tied to City Council's approval of the rezoning, though advocates at the time were confident that Read would follow through on its promise. Though Rabsky isn't legally beholden to the same terms, Dushinsky should still uphold the spirit of the agreement due to the huge impact of the development, Reynoso's office said. "We support the Rheingold petition," said Lacey Tauber, who works for Reynoso's office. "The community came together to assess what was needed to mitigate the huge impact of this project on Bushwick. We believe that the agreements reached during ULURP must survive the sale of those properties."